Home » Entertainment » Hollywood » Hollywood Buzz » Google’s got Movie Trailers in Search Results! Google’s got Movie Trailers in Search Results! Yay! another new feature in Google search results. Now you can watch the movie trailers from the search results page itself! Google will now display the movies that are currently running in theaters plus the movie trailer for you to watch and decide. Detailed on Google’s official Google+ account this week, the search company has added links to movie trailers when a user searches for information regarding showtimes at local theaters. 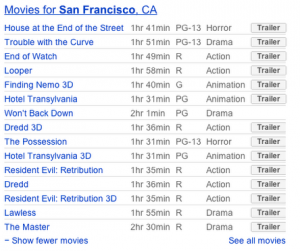 In order to bring up these listings, the user uses a search term like “showtimes zip code” or “showtimes city name” and Google displays all the current movies playing at nearby theaters. As of this week, a new gray button that says “Trailer” appears to the right of each movie listing. When the button is clicked, a pop-up window is launched overlaying the search results page. The trailers are being streamed from a “Googlemovietrailers” YouTube account, but Google doesn’t allow users to browse videos on the account. Users need a direct link to play the trailer on the YouTube page. Depending on the screen size, the overlay window will size itself accordingly and automatically choose the highest quality version of the video. Google also overlays a dark gray color on the remaining white portion of the screen to improve viewing quality. At the top of the overlay window, the user will see the name of the movie trailer on the left and a Google+ Recommend button on the right. However, there’s no rating system included on the overlay for negative feedback. Underneath the embedded YouTube video, Google has included the name of the director, several names of the top actors and actresses in the film and a detailed description of the plot. It’s likely that the inclusion of movie trailers on search result pages will reduce the amount of people that visit sites like Apple, Yahoo, IMDB and Rotten Tomatoes to view a movie trailer. As of right now, the addition of the movie trailers button has been rolled out in the United States as well as other English-speaking countries including the United Kingdom, Australia and Canada. However, Google plans to roll out the new movie trailers button globally as well. Previous: Google Working on a $100 Tablet PC?